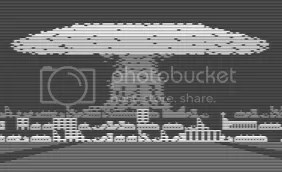 Alright, it's only three levels of Parallax, it just FEELS like bloody loads on an 8-bit. Yes, I know, it’s been ages since I put a post up here. To be honest I’ve just been a little bit stuck for something to write about and pondering another “themed” sequence of articles rather than just grabbing something a bit retro and indie and writing about it. 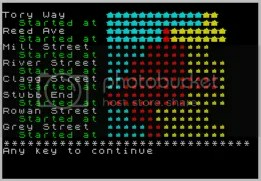 Perhaps a few mini-essays on BBC Micro games, perhaps those write-ups of Amiga indie titles of the ’90s I keep meaning to do. In the meantime, here’s something which grabbed my attention. 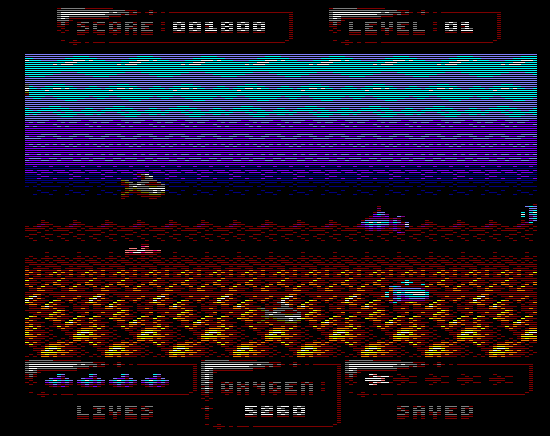 I’m a bit fond of Sub Hunter, an indie title for the C64 with ridiculous Shadow of the Beast parallax scrolling and rather enjoyable arcade action in a coin-op-from-1984 stylee. Well, now it’s been converted to the CPC as well so if you like your computers less brown and built by a grumpy Peer of the Realm who points at people on telly and says “your fired!” you ought to be happy. I’m guessing a Speccy version isn’t going to arrive since this is the sort of game more suited to the C64 and CPC with their chucky multicoloured graphics. Sob! 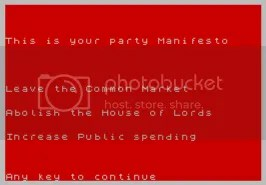 Anyhoo, if you fancy downloading the CPC version head over here; and if you fancy buying an actual physical copy to use in Lord Sirallan’s bulky old ’80 beast clicky here. That is all. For now. Yes, that is a Treen on the far-right. Believe it or not, he'll basically float around the screen like that plastic bag in "American Beauty" only more deadly. Right – Amstrad CPC, let’s do this motherfunker! The first thing I noticed on booting up the CPC Dan Dare: Pilot of the Future disk in my virtual Amstrad was that Dan has green skin in the loading screen. I don’t know either, maybe he’s trying to get in touch with his Treen side. Anyway, the game loaded up and politely requested that I press fire to play so I did. This is the rather undignified way the game renders Digby. He looks like a chunky Trumpton character! Now, the Amstrad didn’t have the most fantastic graphics in the world (none of the 8-bit machines popular in Europe did, really) but they could sometimes look brilliant (see the CPC versions of Head over Heels, Gryzor and Combat School for details) however the Dan Dare graphics looks, frankly, awful. The CPC had a nice, bright palette but the artists here seem to have gone for a “dark and dingy” look and it means we end up with a blocky mixture of greens and greys with Dan’s orange skin being one of the few bright spots. Dan lands on an artificial asteroid controlled by the evil Mekon and, from what I can gather, needs to save Digby (unflatteringly rendered in-game as a bit plump, although to be honest so is Dan) who has been trapped on the other side of a chasm by finding things to bridge the chasm and take them to the room Digby is trapped in (and I mean “things”; that’s what Digby calls them “Find more things, Dan!” he says). Find a “thing” and add it to the makeshift bridge and previously-closed doors open (why this is, I’ve no idea) meaning Dan has access to more of the meteorite. Trying to stop Dare doing all this are Treens (all of whom float around, more on this later) and gun emplacements – some static and some moving. Because of where I shot this gun, Dan will find it difficult to jump that gap. Nice thinking, guys. 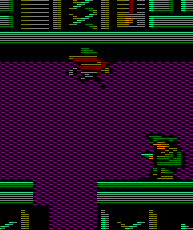 Now, the graphics aren’t too hot but the CPC version of Dan Dare really falls down when it comes to gameplay. At the most basic level, this is actually quite a good game – Dan runs from room to room shooting things up and looking for “things” to use to make a bridge to Digby (who is a bit restless, maybe the Mekon won’t let him go to the toilet; that evil Mekon!) but the controls is all wrong. Everything is a bit too sensitive and Dan goes whizzing off like Linford Christie trying to catch a bus if the player nudges left or right. It doesn’t help that the designers filled the game with gaps for Dan to jump and it’s all to easy for the player to accidentally drop Dan down a gap in his haste. It also doesn’t help that many of the moving gun emplacements are in the ceiling and, when shot, can end up immobile and hanging over a gap. The reason this is such a pain in the arse is that they are “solid”, so to speak, and if Dan hits his head off them he goes straight down. In a game with a lot of pits to drop where the player isn’t always going to take care and shoot the enemy when it’s not in an “inconventient” place, you can see the trouble this can cause. And the Treens are all wrong. For starters, rather than running around and chasing Dare they all fly around the place like ghosts with goldfish bowls on their heads firing lasers here there and everywhere. If Dan touches a Treen then they take him to prison and he loses a life (this also happens if he falls down a hole). Infuriatingly, Treens often “materialise” behind a large pillar or other bit of scenery and have a bad habit of sometimes hanging around the top of the screen (where they’re also obscured) meaning the player can’t even see them a lot of time. So you need to be prepared for Dan running past a pillar and then being told he’s been captured and sent back to the prison (by the way the “prison” has an open door and isn’t guarded, someone needs to have a chat with the Treens about that) because it’s going to happen quite a lot. Although, to be honest, not that much because I imagine most people are going to get sick of this flawed, ill-designed game quite quickly. A bit of tweaking the gameplay here and there and it might have been quite good. As it stands, it’s too flawed to be worth spending much time with. Dare! Dare! Dare! But which of you is best? There's only one way to find out... FIGHT! I was wondering what to write about next when, whilst reading a friend’s blog about board gaming, I idly followed a link to an online ZX Spectrum emulator (the point of this completely eludes me – I have three Speccy emulators on this PC which is, to be honest, three more than most people would ever want) and idly scrolled through the list of games available before settling on Virgin Games’ Dan Dare license from 1986. Then it struck me – a series of articles about those first Dan Dare games. Dan Dare, for those who don’t know, is a British sci-fi comic book character (kind of like Buck Rogers or Flash Gordon, only with tea and crumpets) who spent his time fighting aliens from Venus called “treens” assisted by his plucky Lancastrian sidekick Digby. 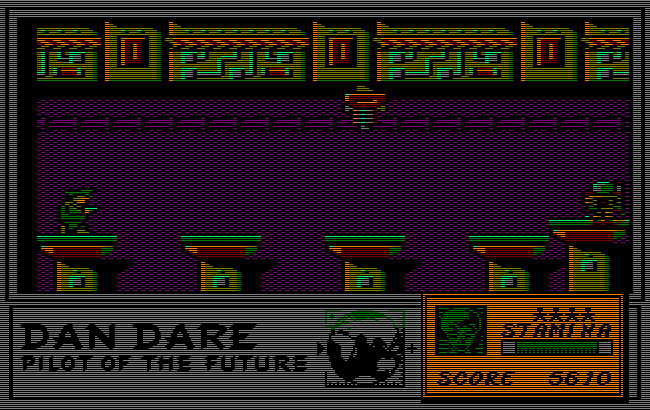 A game based on Dan Dare (called Dan Dare: Pilot of the Future) was released by Virgin Games for all the major home computer formats in 1986 – ZX Spectrum, Commodore 64, Amstrad CPC. Nothing unusual about that, of course, licensed games were a big thing at the time. What’s interesting about this game, though, is that it was noticeably different game on each format. In fact, in the case of the Commodore release, it was a different genre. This kind of thing still happens to some extent – witness the wildly different “cut down” or “re-imagined” versions of next Gen console or PC games converted to relatively underpowered handhelds, for instance – but the idea of a game (and a licensed game at that) being developed separately and differently on three machines whose abilities weren’t all that different and were more than capable of playing the same kind of game is rather odd. Different times, folks, different times. Dan Dare spawned two sequels – predictably called Dan Dare II and Dan Dare 3. By the time these games were released, the usual conformity had returned and the different platforms basically got the same game. Whatever crazy notion or sheer neglect had lead to Virgin allowing three distinct versions of the Dare licensed game to be released on separate formats had been righted (or, perhaps, wronged). What I’ll be doing is playing each conversion for an hour or so and then writing what I think of them, what works and what doesn’t and, most importantly, which platform had the best Dan Dare game. I’m going to be utterly non-partisan about this, incidentally, I’ll have to beat down my childhood-nostalgia-based prejudices. 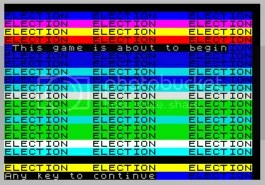 The only ones I ever played in the heyday of 8-bit machines was the Spectrum version and (very briefly) the Amstrad CPC version (on a green monitor, I seem to recall, naff-tastic!) but I’ll be trying to approach them as-new, sternly assessing each and every aspect of gameplay like a humourless government inspector with his clipboard and toothbrush moustache, eventually sticking a “best Dare” rosette to one of them whilst a crowd stands and applauds. Let’s see what one it’s going to be shall we? I almost can’t wait! 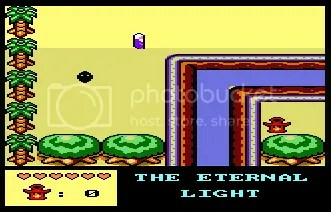 Eternal Light – go forth old man and find those lanterns! The title screen that greets you as the game loads. This is lovely stuff, actually. What do I have? What’s this in my big box of magical things underneath the Great Suprendo’s glasses? 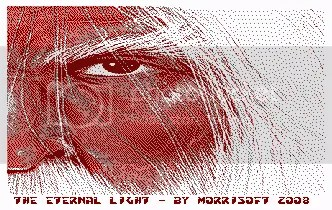 Why it’s a new indie game for the Amstrad CPC called Eternal Light! 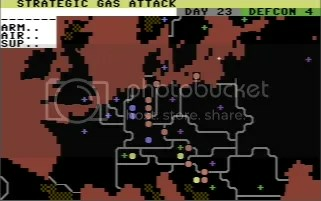 Now, first off I should tell you that this game has been written in BASIC with a bit of help from something called the “Sprites Alive” which, I presume, makes sprites move around the screen. Secondly, that it’s by someone called Morrisoft and it apparently took six months to write. "Watch out for that black ball-shaped... thingy, grandad!" grandad wandering around in his dressing-gown) who explores a maze of screens looking for lanterns. I’m not sure why he’s looking for lanterns but they surround him on the title screen so they must be quite important to him. Maybe they’re those Chinese lanterns people release into the air and that people keep mistaking for flying saucers and that have come down to land and our hero has to fetch them all back because the company that sells them is really cheap; maybe he just really really likes lanterns and has a house full of them, that and cats. Anyway, why blokey is wandering around in his gown hunting down lanterns is unimportant, it’s what he does and why he does it isn’t really any of our business! What matters, as ever, is how this game plays. From what I’ve described of the game you’re probably thinking that it’s a little like Sabre Wulf or Project Future and, yes, at its most basic the gameplay is like that. But it’s nothing like those games to actually play, and the main reason for this is one of speed. Yes, this game is slow. It’s very slow. It’s probably slower than Magic Pockets and that’s jolly slow. Now, the programmer says this game is written in BASIC and, assuming Amstrad CPC BASIC is a bit like Speccy BASIC I assume that means that it stops things running at a fair old rate. If this is the case then that’s understandable but it doesn’t actually change the fact that this game is fairly boring to play as a result. It takes ages to have grandpa lantern-lover wander from one side of the screen to the other and when you enter the next screen there’s a wait of about a second and a half until the next one shows up. That’s making a slow game even slower! "Help me please! I move slower than the Bitmap Kid!" Most of the game consists of wandering around the maze-like play area looking for the lanterns. Some are easy to reach, some are behind “puzzle” obstacles like women who won’t budge until you find their missing brother. So there’s a very slight arcade-adventure element to gameplay as well. There’s not really much to fight. 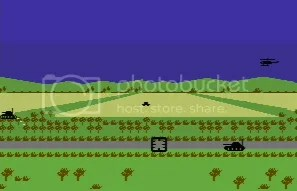 The only enemy I encountered was some kind of little black ball things which bounce around the screen. They can be dispatched by a magical blast/stale roll fired by our magical/geriatric hero but it never gets either especially challenging or exciting. Energy is represented onscreen by a row of hearts (or are these lives, again I don’t know and I suppose it doesn’t matter). When our hero is touched by an evil ball-thing one of these hearts is lost and when they’re all lost it’s game over. One thing I really did like about this game, though, is the presentation. Things open with an excellent high-resolution loading screen and the in-game graphics are, in the main, pleasantly chunky and colourful. I particularly liked the background graphics which had a nice Zela-esque feel and represented paths, forests, rivers and mountains nicely. It’s a shame the bad guys look so naff, though. Sound’s pretty good as well – no tune but lots of pleasant blips and blops as whitebeard goes about his business. This game isn’t exactly packed with great art but it’s above-average for something that’s been knocked-out by an independent developer. Overall, though, this is just too slow and unexciting to grab the player. It looks nice and I think there’s definitely something there that can be expanded on but currently all we have here is a slow, rather boring maze game with some nice graphics. Speed this up, add a few more nasties (which are a bit more threatening) and maybe a bit more variety to the maze and a smattering of bonus pick-ups and you’re heading into the realms of proper old-school maze game. At the moment what we’ve got feels like nothing so much as a work in progress to show the boss, let him know you’re getting on with that Sabre Wulf beater but that you’ve not finished yet. Because there’s still much to do. And that’s a shame.